Woohoo! The trees have leafed out. Though the cherry trees, tulips, daffodils, and forsythia have already finished blooming, the azaleas, iris, and hardy gerbera daisies have started flowering. I have even taken my first two trips to my favorite garden center, scouring for my top picks of herbs, veggies, annuals, and other cool plants for my garden. Some of the first plants I look out for in the spring are lemon verbena, basil, lavender, and pineapple sage, among others. 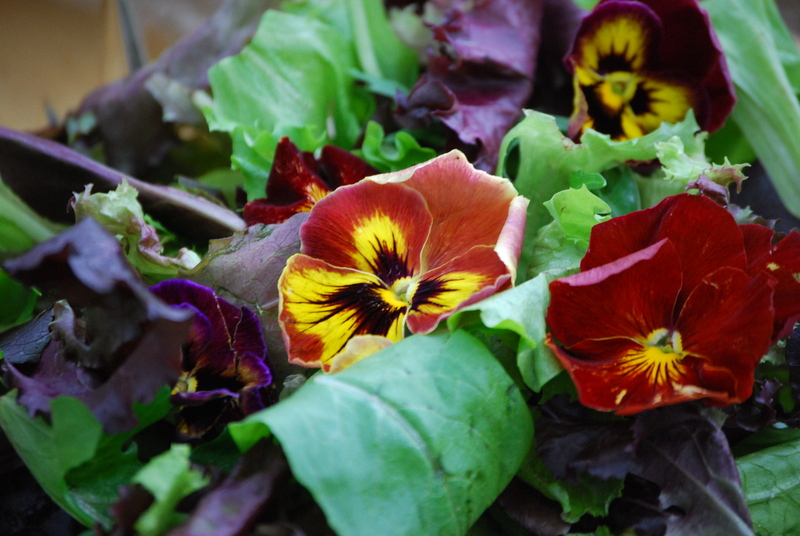 I plant these in my own garden, as well as in the gardens I help plant in my therapeutic horticulture programs. Every time I walk past them, I can’t help but reach out and touch their leaves, and then smell the fragrance transferred to my fingers. Every time. Plus, I love how they attract pollinators to the garden throughout the warm growing season. In fact, I often say that if it wasn’t for the pineapple sage, my two hummingbird friends would never have sought refuge in my garden. 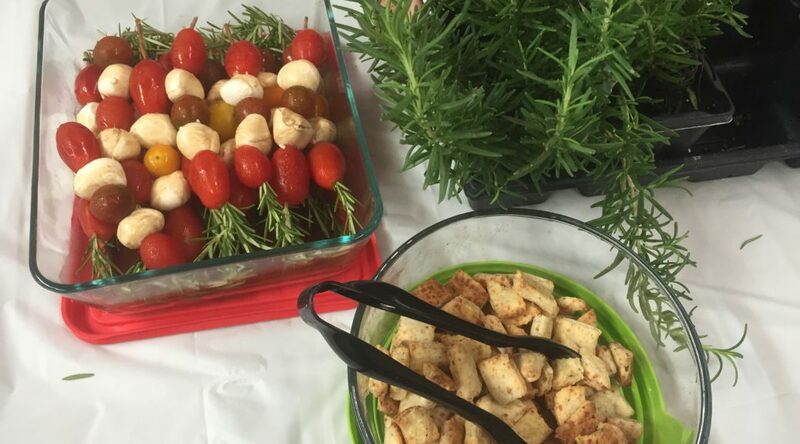 With all this excitement at the beginning of the warm growing season, I look forward to a favorite activity that incorporates the use of herbs for culinary and other purposes. 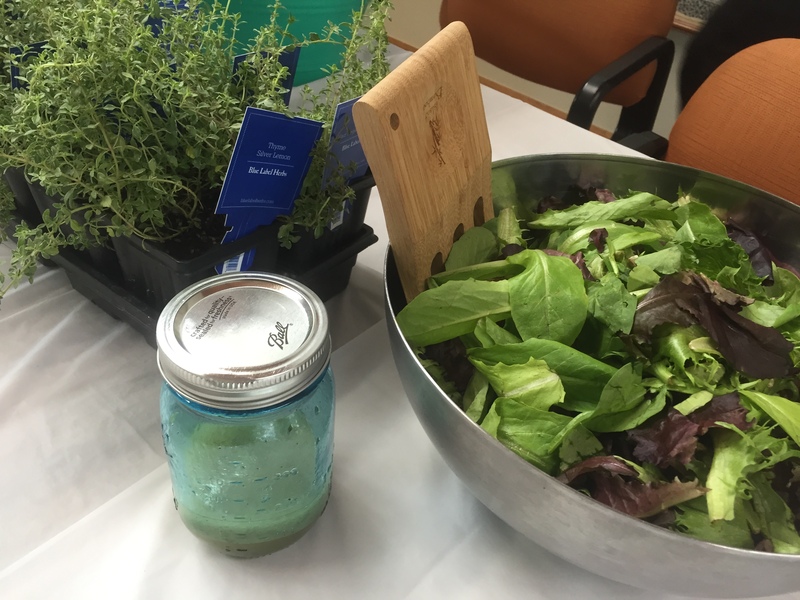 Recently, I invited the volunteers who assist me with my therapeutic horticulture programs over to my house for a “Thank You and Did I Say That I Appreciate You So Much?” lunch. (Did I say just how much I appreciate my volunteers? Well, let’s just say that it is A LOT.) 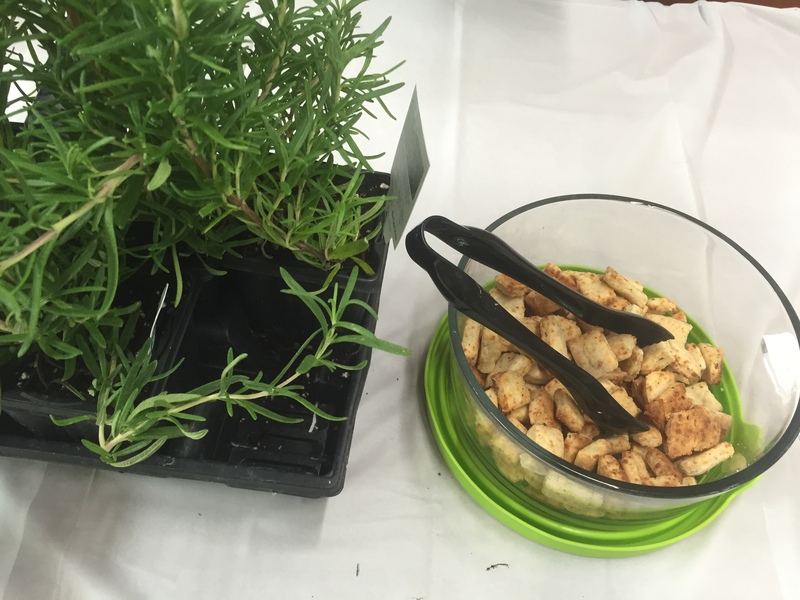 I displayed potted plants of these four herbs and then we ate a dish featuring that herb. I will share these recipes (and links to their inspiration) below. 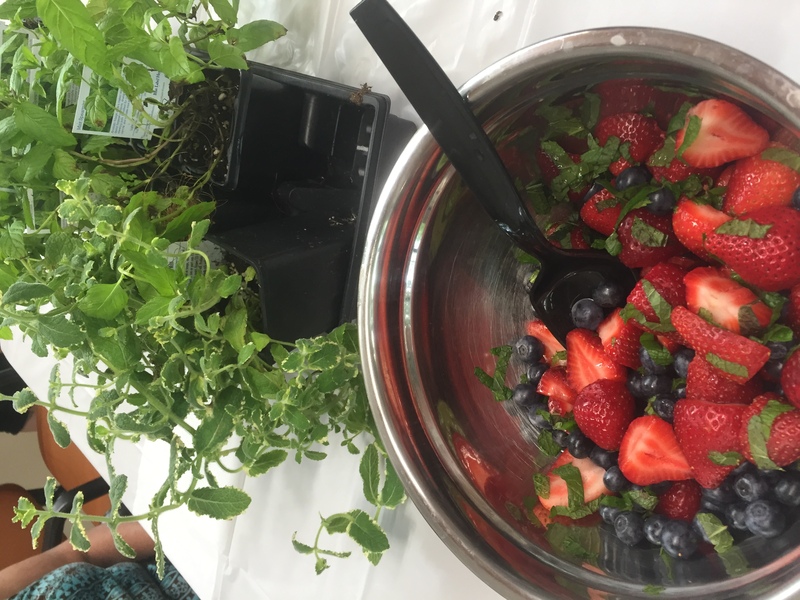 At the end of lunch, the volunteers got to take home a tray with a 4″ pot of each of the four herbs, plus a bonus coleus for added ‘thanks’ and a container of pineapple sage salsa. This makes for a great activity with therapeutic horticulture groups and can be replicated and delivered in a variety of ways year-round. Participants can be actively involved in the growing of the herbs – from seed to harvest – and recipe preparation. 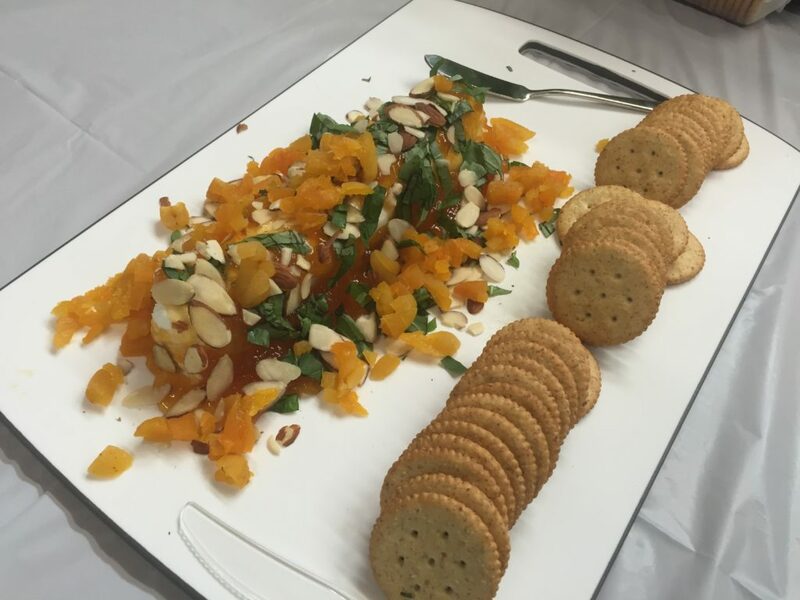 Before doing any food-related programs, always ask ahead to see if it is ok for participants to make and sample food. Some facilities have dietary and other restrictions. Salvia elegans is a perennial hardy to USDA Zones 8 to 11 or can be grown as an annual. It grows two to three feet tall in one season and has beautiful red flower spikes in late summer to fall. 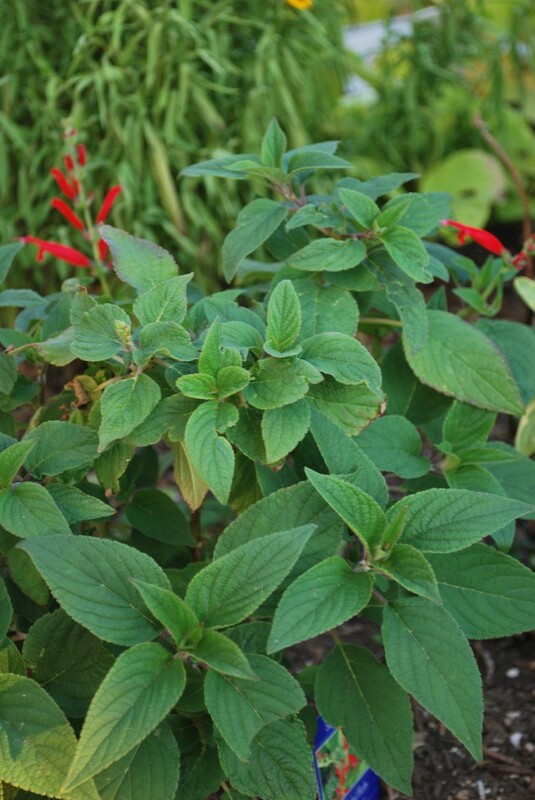 California’s Mountain Valley Growers appropriately calls pineapple sage a “hummingbird highway” for hummingbirds’ attraction to the red flowers. When rubbed, the green leaves produce a pineapple scent. The flowers and the leaves are edible and can be used to flavor salsas and drinks and make floral sugars. Recipe based on Nat’s Pineapple Sage Salsa from Sweet Valley Herbs. 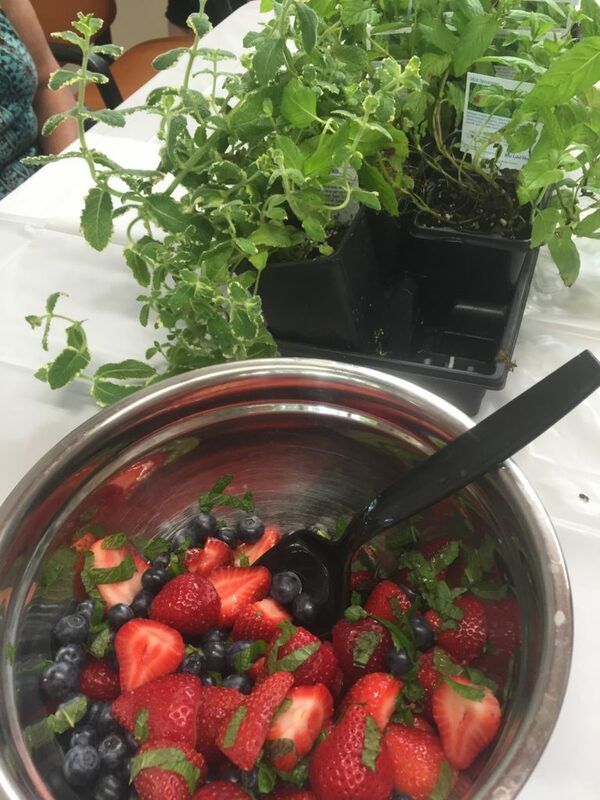 There are so many varieties of basil (Ocimum basilicum) out there – Mrs. Burns’ lemon basil, lime basil, cinnamon basil, purple leafed basil, (the ball shaped) boxwood basil, Thai basil, and the straight-up Genovese sweet basil, among many others. I love the variegated Pesto Perpetuo – though I can NEVER find it for sale locally. It has a green-creamy white variegation that ornamentally looks great in a mixed border and is also good for culinary use. 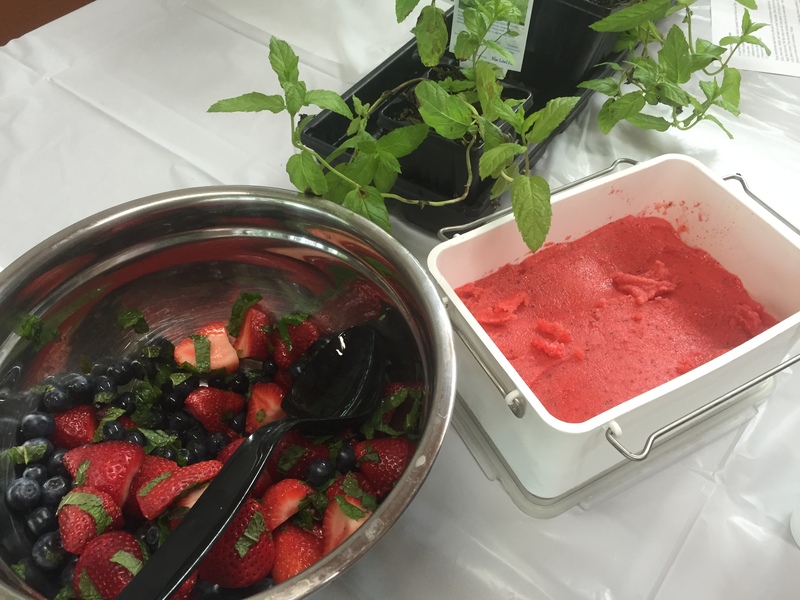 Check out this link at Hobby Farms to find uses for 10 varieties of basil. 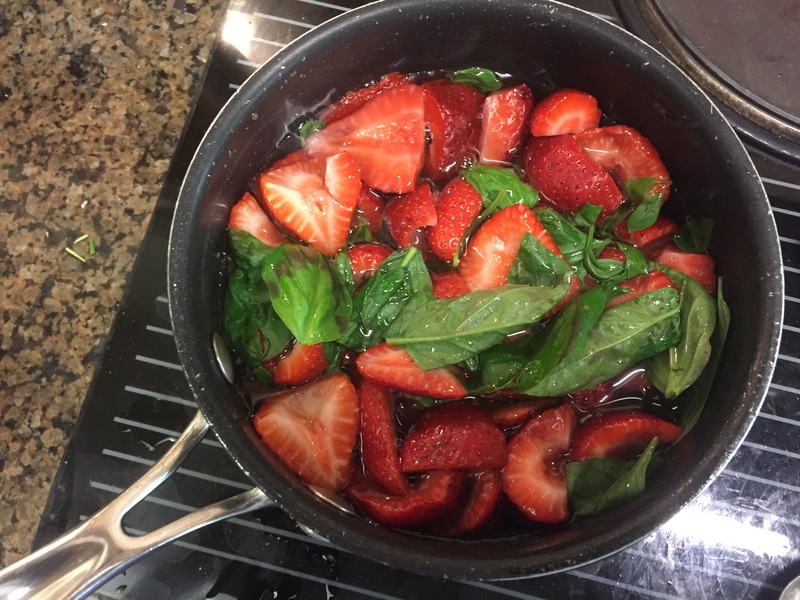 With the recipes below, I used Genovese basil. 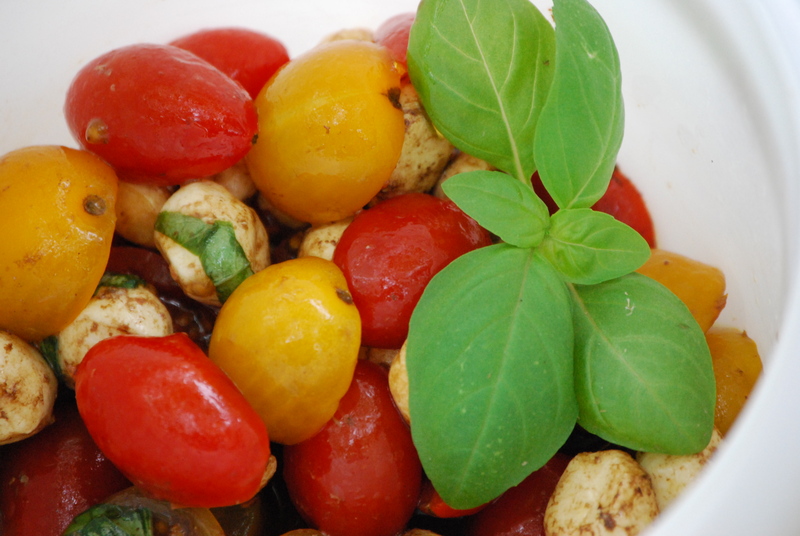 Combine red and yellow tomatoes and mozzarella pearls in a bowl. Rough cut basil leaves and add to mixture. Add balsamic vinegar and olive oil and mix well. Refrigerate for about 30 minutes to allow vinegar and oil to infuse into the mixture. Or serve immediately. Recipe based on Fresh Tomato and Mozzarella Salad at Food.com. Add softened butter to a mixer bowl. 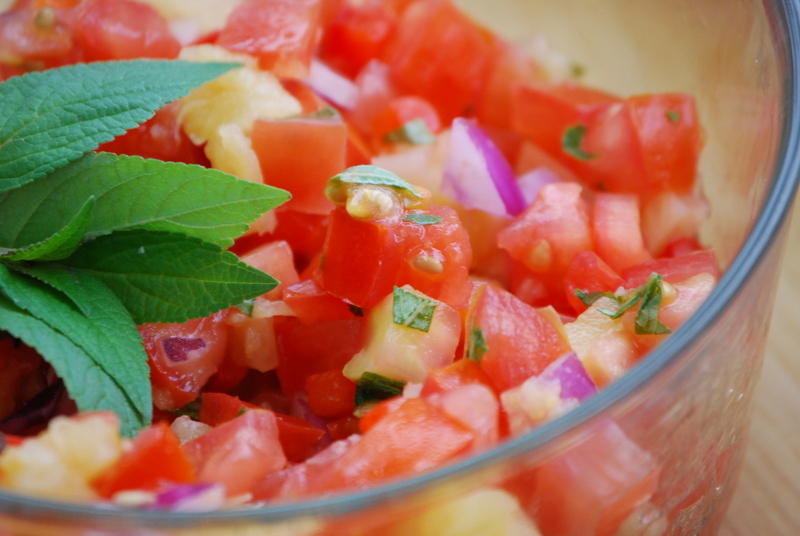 Finely cut basil, parsley, and oregano and add to bowl. Mince garlic and add to bowl. Add onion powder. Turn on mixer and combine well. Apply butter mixture to bread or chips and enjoy. 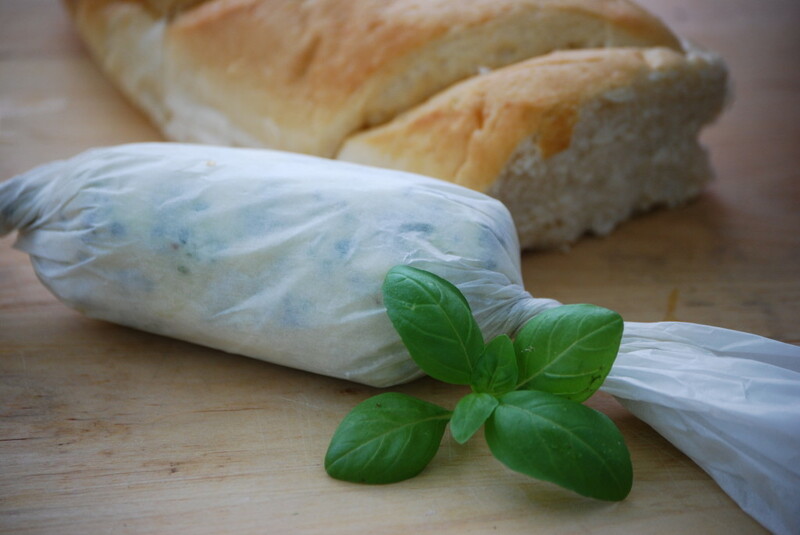 To store, spoon butter mixture onto parchment paper and roll into a cylinder shape. Secure ends by twisting parchment paper to close. Refrigerate when not in use. 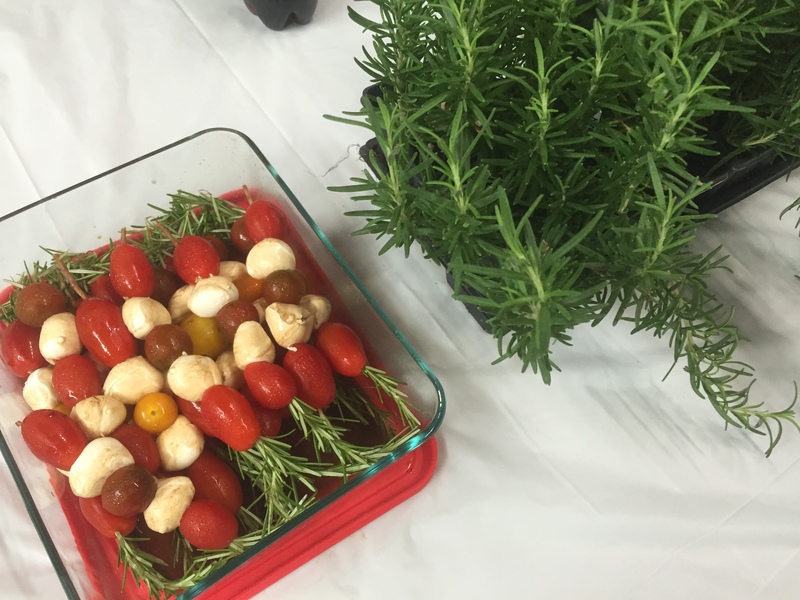 Recipe inspired by DIY Herb Butter at Sisters Saving Cents. There are several herbs that have lemon scented foliage, including lemon balm, lemon thyme, lemon grass, and lemon scented geranium. For therapeutic horticulture programs, it would be fun to do a lemon scented plant centered program and have participants discover the variety of plants that offer their own version of lemon fragrance. 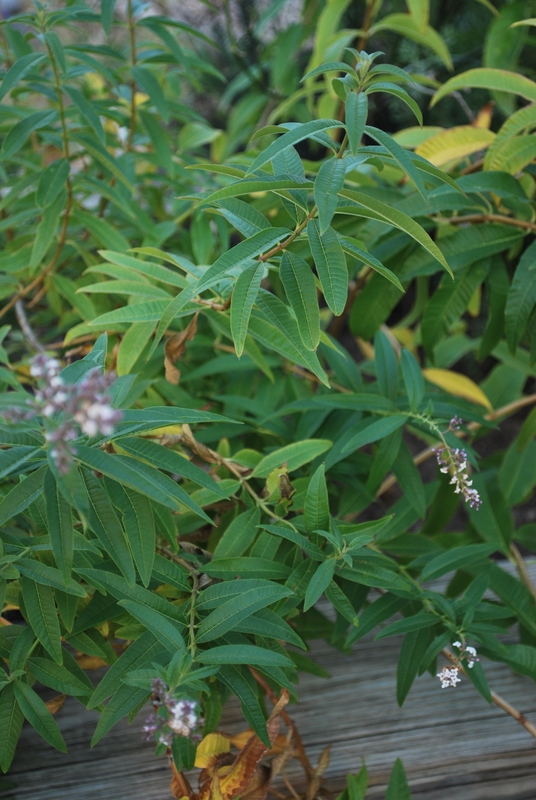 One favorite, lemon verbena (Aloysia citriodora), is an annual with lemon-scented leaves and delicate white flowers. It grows to about 18 inches tall. I grow it in pots during the warm season – then in late fall, cut it back and bring it indoors to overwinter. Next spring, bring it outside and watch it leaf out. 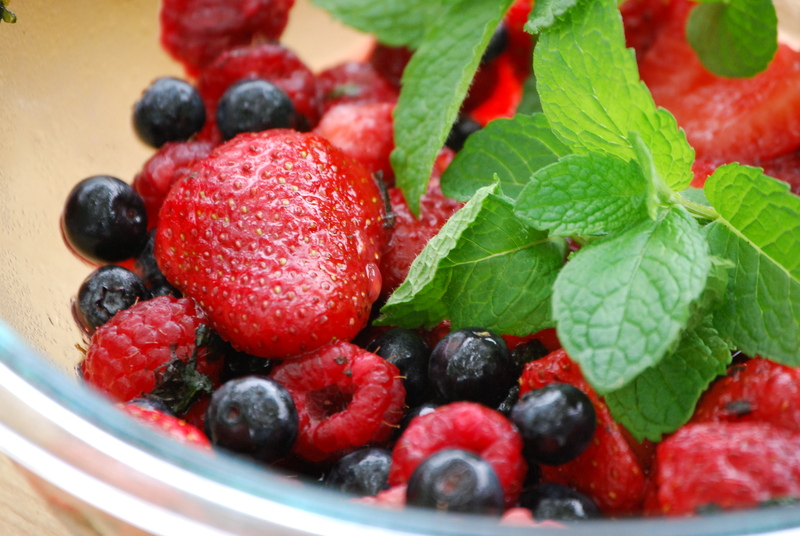 It can be used to flavor salsas, floral sugars, baked goods, cold desserts, and drinks. To create the lemon verbena simple syrup (shown in above photo), combine sugar and water in a small pan over medium high heat and stir until sugar is dissolved. Remove from heat. Add lemon verbena leaves to simple syrup mixture and let steep for 30 minutes. Strain simple syrup mixture and discard lemon verbena. Add the juice of one lemon to the syrup. Fill glasses with ice – I made ice cubes by filling ice cube trays with water and then adding lemon verbena leaves before freezing. Pour 3-4 tablespoons (or a shot glass worth) of the simple syrup over the ice. 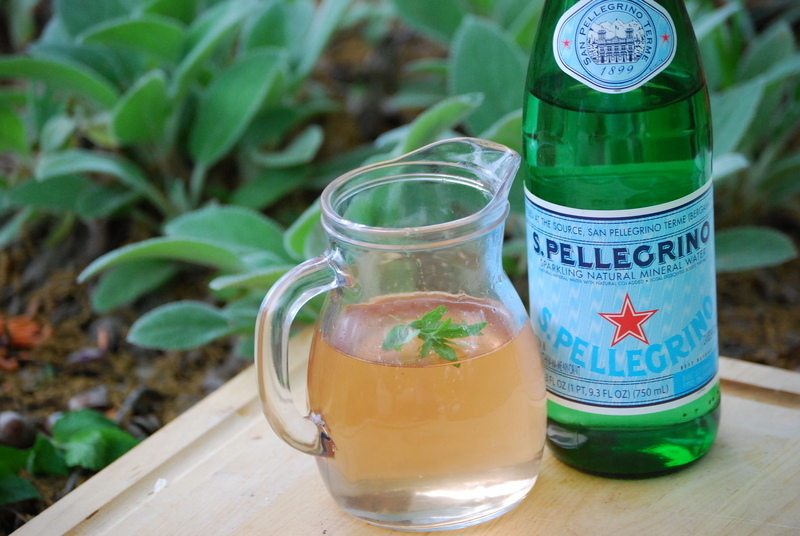 Fill glass rest of way with sparkling water. Optional, rub lemon verbena leaves on the rim of the glass and add lemon slices to glass before drinking. Enjoy a light and refreshing drink! Recipe inspired by Herbal Sodas recipe from Martha Stewart. Oh, lavender, how sweet you are! 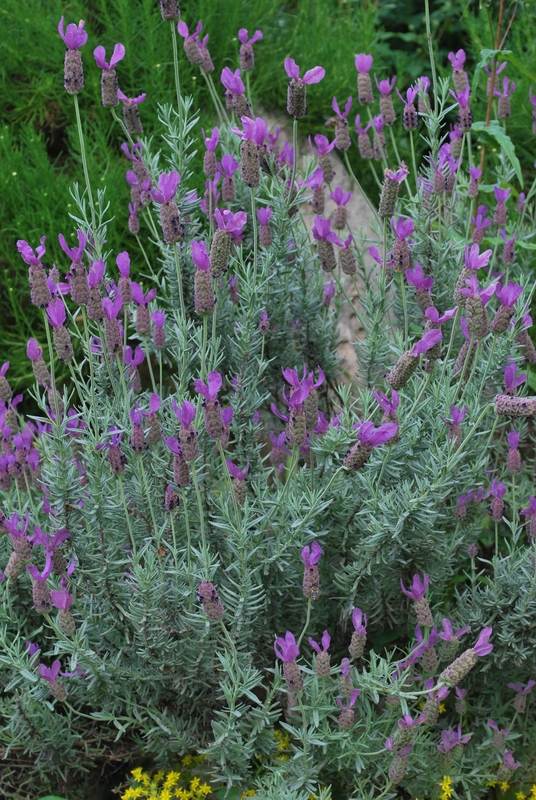 There are so many therapeutic programming opportunities for lavender (Lavandula) – sachets, herbal spritzers, handmade spa products – and it is also edible. I buy edible dried lavender buds (which has been processed for consumption) at the natural food market and use this for culinary purposes. I also buy bulk lavender buds online for the other aforementioned uses. 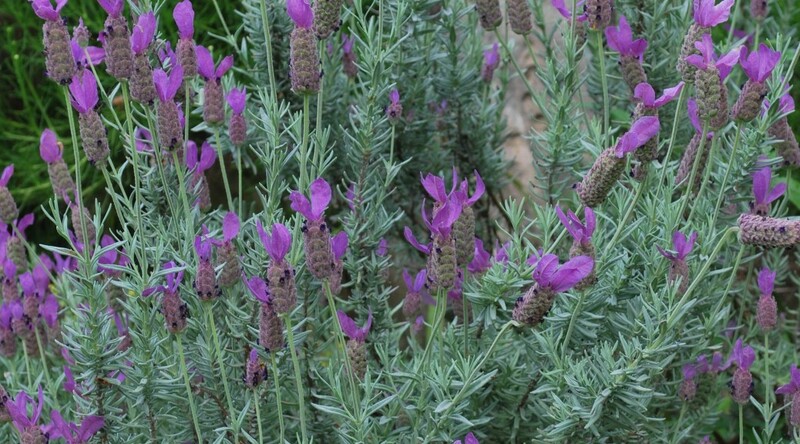 When growing lavender, I have had the most success with fernleaf lavender (L. multifida, annual) and ‘Goodwin Creek’ lavender (tender perennial), over any of the other options available. That may be different in other areas of the country (and with different gardeners). To create the lavender simple syrup, combine sugar and water in a small pan over medium high heat and stir until sugar is dissolved. Remove from heat. Add lavender buds to simple syrup mixture and let steep for 30 minutes. Strain simple syrup mixture and discard lavender. Combine lemon juice and 2.5 cups of the lavender simple syrup. Refrigerate. Add lavender simple syrup / lemon juice mixture to ice cream machine. Turn on and run for 30 minutes. 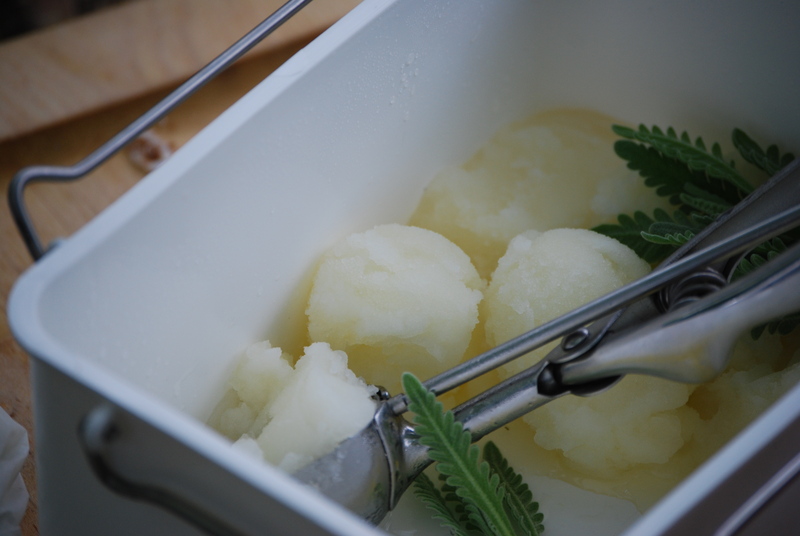 Then scoop sorbet mixture into container and freeze for about two hours. Enjoy! Lavender simple syrup recipe and Lavender Lemon Sorbet recipe inspired by Cuisinart.